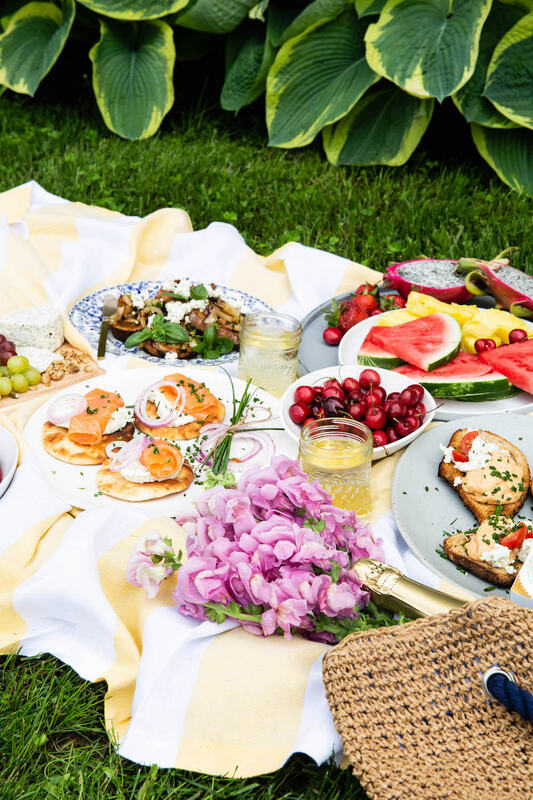 Whether you are looking to host a romantic picnic, gathering with friends or a family activity at the park, picnics are a must during warm weather. Day-cations away from home and the perfect outing to catch up with friends and family. 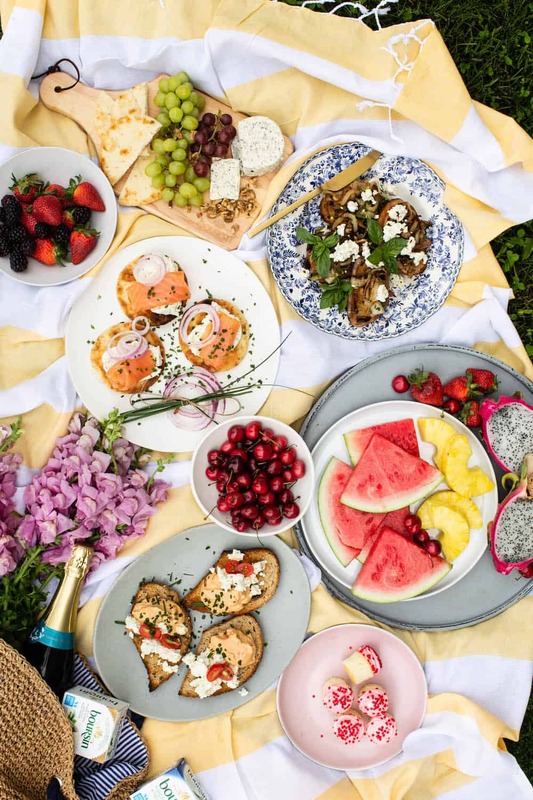 This Summer Chic Picnic Guide will prepare your the ultimate picnic experience with effortless sophistication. 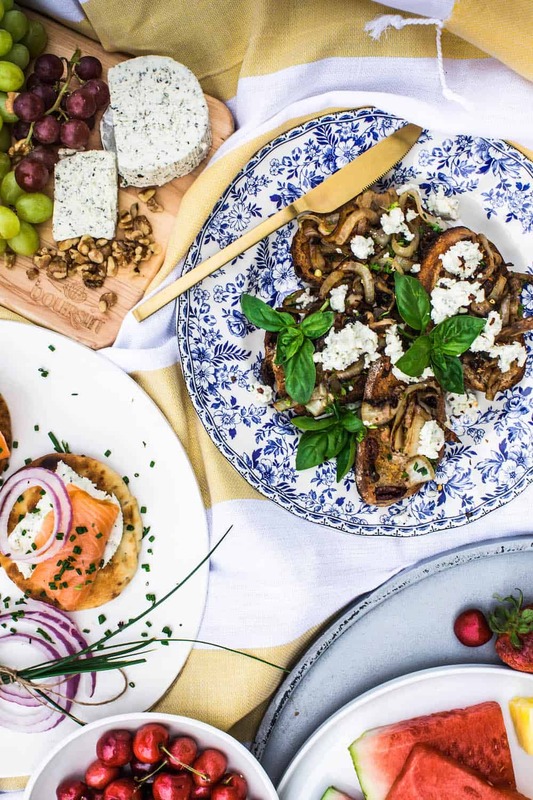 I’ve also provided a few easy make-ahead recipes with my go -to Boursin cheese, that are perfectly portable and can be quickly assembled to wow your guests. Cheese please! the one thing I can’t live without and such a great addition to any picnic. Boursin is not only my favourite because of its many flavours and versatility, but because when added to recipes, it gives them SO much flavour, elevating every dish it goes into. Simple snacks that can be made ahead are the best kind. 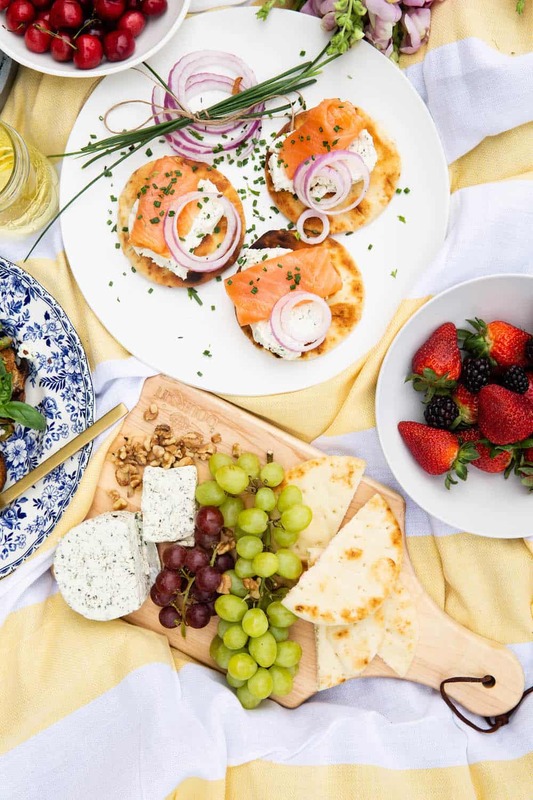 Boursin cheese and a little prep beforehand will definitely bring your picnic to the next level. 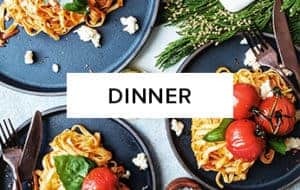 These two recipes are a breeze to put together, easy to eat, no forks or knives are required and most importantly, as anything you add Boursin to, will be vibrant and delicious. The first one is Smoked Salmon Naans with Boursin Shallot and Chives. Simply Unwrap the cheese and cut into thin rounds. 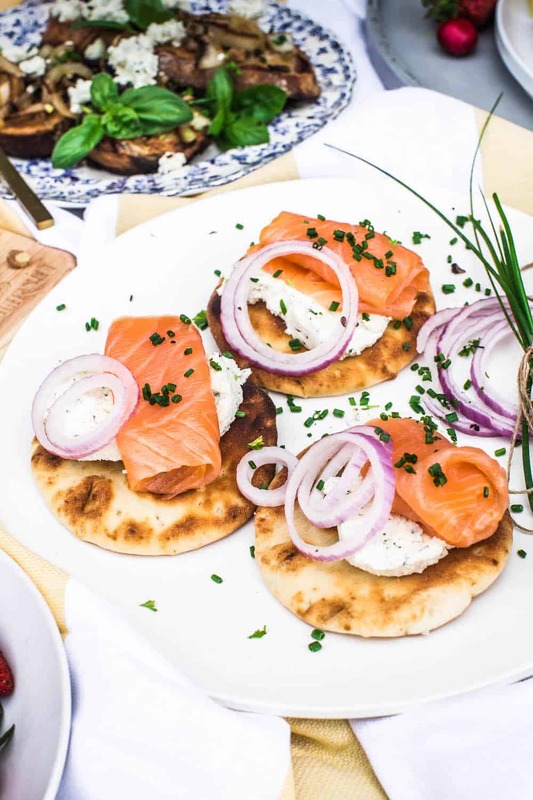 Top 8-10 mini Naan breads with a slice of Boursin, smoked salmon, red onions and chives. Effortless and bound to become one of your favourite snacks! In a medium frying pan, heat the oils over medium heat and sauté the onion until translucent and golden brown. Add the garlic and mushrooms. Continue to cook for about 2 minutes. Add salt, pepper and parsley, stirring until combined and set aside. Slice bread in thick slices. Here you have the option to toast them at home or leave them as is. 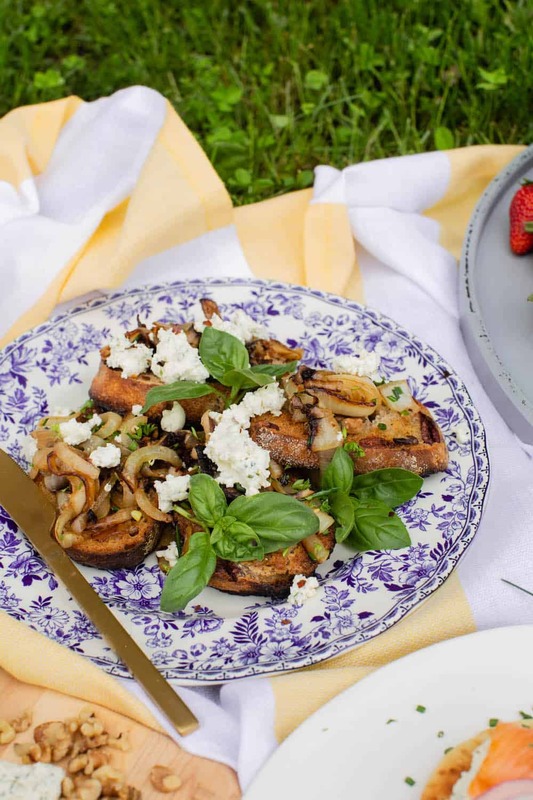 At the picnic, top the bread slices with the mushroom mixture and add a spoonful of Boursin Bouquet of Basil and chive on top. 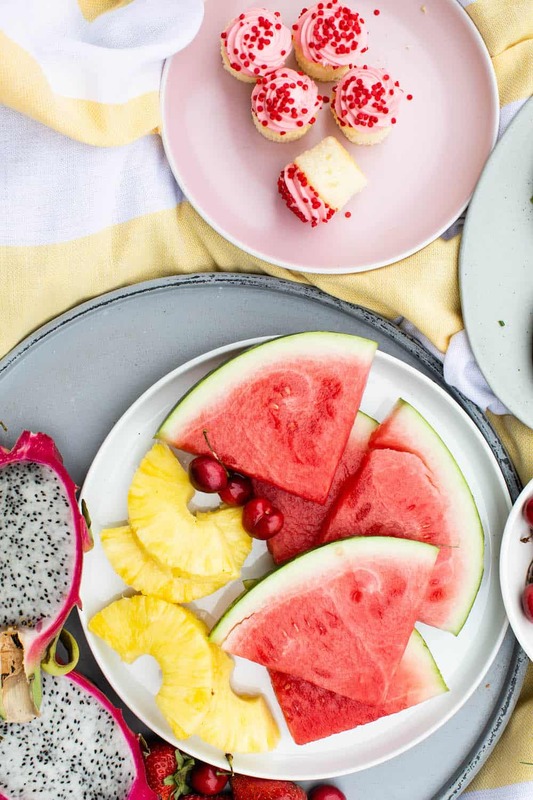 Whats a picnic without watermelon? Another option would be mixed berries, cherries, grapes to pair with cheese and pineapple slices. It doesn’t have to be a potato salad. Bring your favourite greens and top with pre sliced cucumber, tomatoes, walnuts and feta. Pack the vinaigrette in a small mason jar for easy transport. Galettes are hands down my favourite picnic dessert, but cupcakes are fun too. Stop by your local bakery and pick up a few. 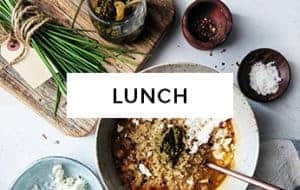 Have a variety of options and ask your friends to bring their favourites too.Bring plenty of water, iced tea, and a selection of wine, beer and prosecco. I find you can’t go work with a homemade pitcher of sangria. Having said that, it is important to remember that many parks and beaches have restrictions on publicly consuming alcohol, so make sure to research your desired destination’s policies. A picnic without drinks is like a day with no sun, or so I believe anyways 😉 Nothing is more inconvenient than packing a cooler with drinks and not having the tools to open them. Grass stains are not welcomed at this party. Bring a wide blanket to sit on, preferably dark in colour in case theres a any spills. Always be prepared and bring more than one for each person, just in case unexpected guests arrive. 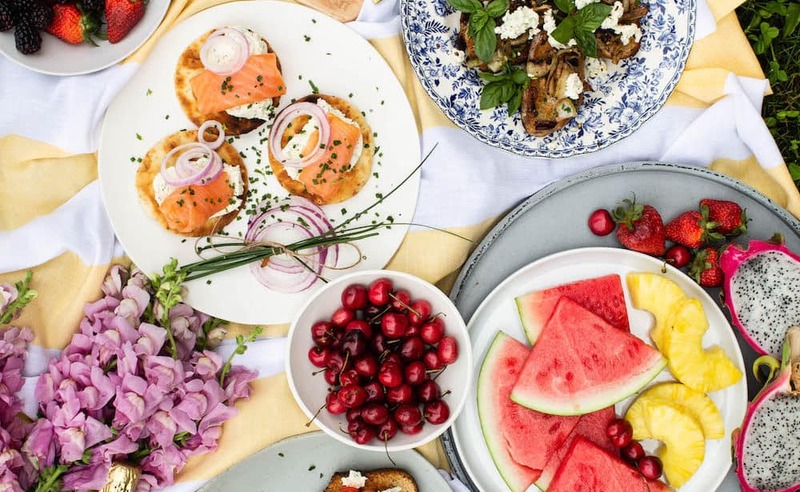 Keep it simple by planning a menu with finger food, pre- cut vegetables, fruit and a cheeseboard. Reusable or disposable, always have them handy. Every picnic will generate trash, including plates and packaging. make sure you pack out like you packed in and leave no trace after your picnic. Believe me when I tell you that even if it’s a bit cloudy, sunscreen is a must and you don’t want to end your summer picnic with a sunburn, so make sure you bring that SPF! A cooler is a must to keep your drinks always cold and to store any leftovers that need refrigeration. Need Coffee but no cafe in sight? At this moment instant coffee is definitely a bonus. 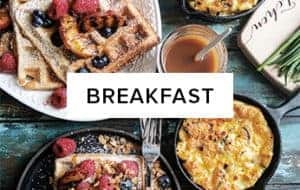 Prepare the boiling water ahead of time, pour it in a portable thermos, bring one with milk as well and add the instant coffee when ready to serve, Voilà! instant lattes! I hope your summer is filled with outdoor fun and great company from you closest friends and family. 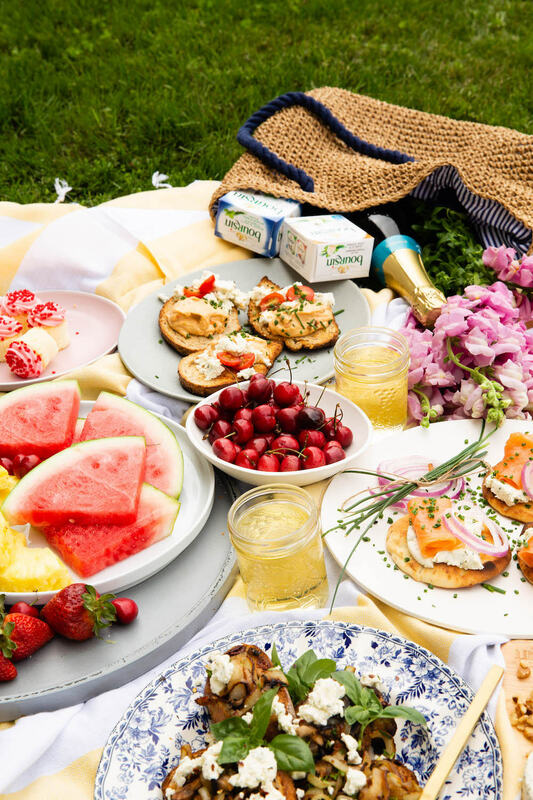 Cheers to picnic season! 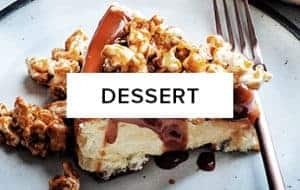 This post was made in collaboration with Boursin, however all views, opinions and recipes are my own. Thanks for supporting brands that make Diala’s kitchen happen!